Will my laptop be secure on this holder? Your laptop will rest on two pegs at the bottom of the laptop mount. Adjustable side clamps will secure your laptop in place. Is the angle of the laptop holder adjustable? You can mount the laptop holder at two different angles. The shallow angle allows your laptop keyboard to be more level while the steeper angle takes up less space. Once mounted, the angle of your laptop can be adjusted further by adjusting the tilt of the monitor arm. Is the laptop holder compatible with other monitor arms? No, the VESA mount on the View Monitor Arm has special cut-out specifically designed to mount the laptop holder. 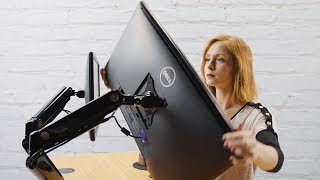 This laptop holder is only compatible with the View Monitor Arms. Will this hold a Macbook? The UPLIFT View Laptop Mount will work with most MacBooks. However, it is not compatible with the MacBook Air, which is too light to engage the cylinder. Can I adjust the position of the side brackets? Yes, the side brackets can be placed in a variety of different positions along the holder so that they won't interfere with your laptop keyboard. We don't recommend typing on your laptop while it is being supported on the View Monitor Arm. This setup is best used with a separate keyboard. You can even use the USB ports on the View Monitor Arm base to plug in your keyboard! What size laptops does this hold? The side brackets are adjustable to fit 10.1" - 17.3" laptops. The View Monitor Arm will support laptops weighing 4.4 - 19.8 pounds. The View Laptop Mount is available in your choice of colors: black, gray, or white.